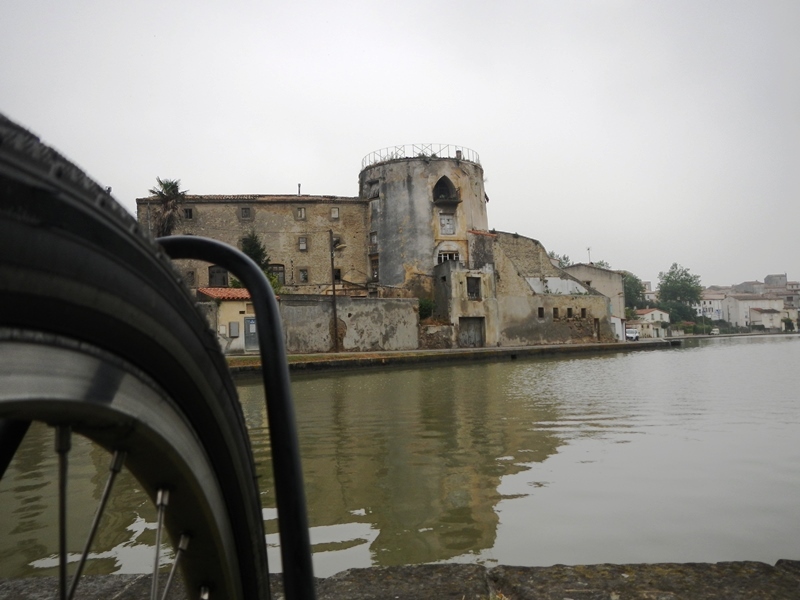 Still full after our cassoulet the previous night and feeling good after our day off, our next day was scheduled to be another long one aiming to complete 65 miles along the Canal du Midi. After the storm in the night it was still overcast in the morning when we got underway. 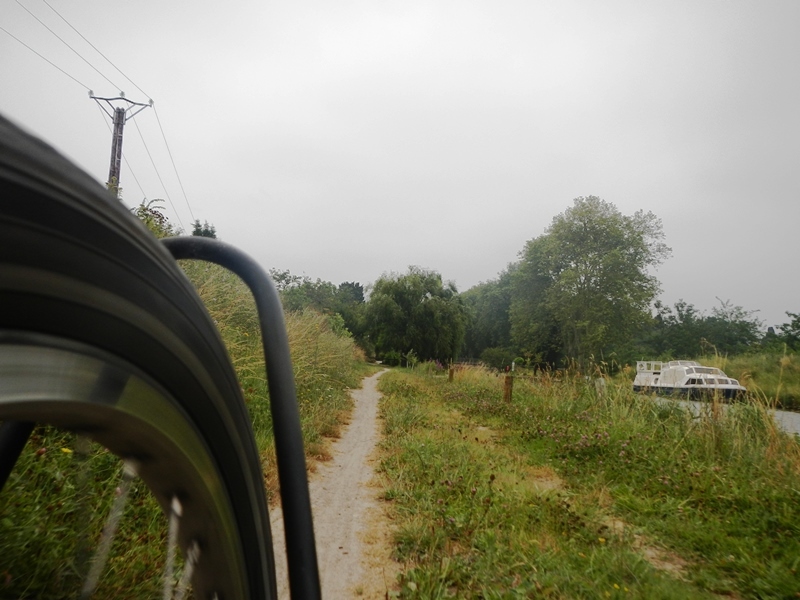 From where we joined the canal back near Bordeaux until now, the path we’d been following was a relatively smooth tarmacked one. On the map it had been a solid green line but after Castelnaudary it changed to a green dotted line. At first it wasn’t too bad, hard packed gravel and dirt with only the occasional pot-hole or rut and we were able to keep up roughly the same speed as we had been doing on the tarmac. 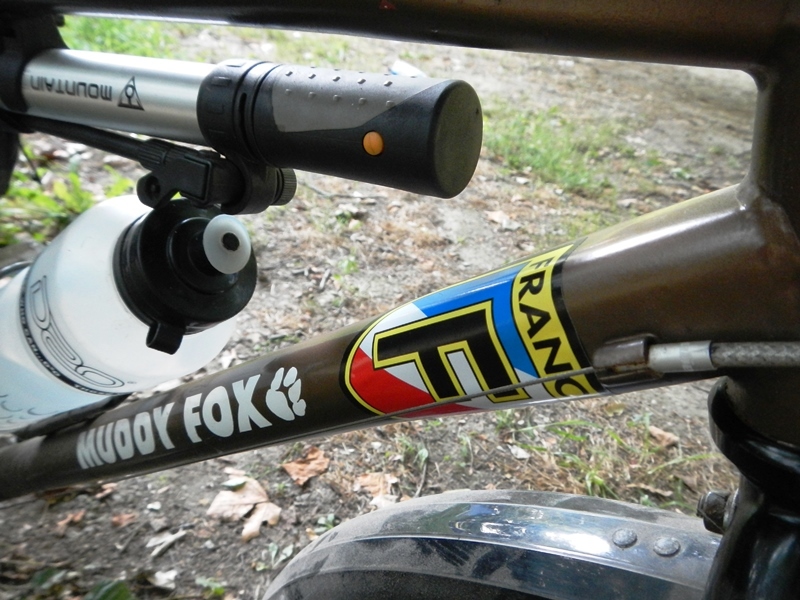 After 10 miles though it started to deteriorate further as the tracks got much narrower and a lot more rutted. 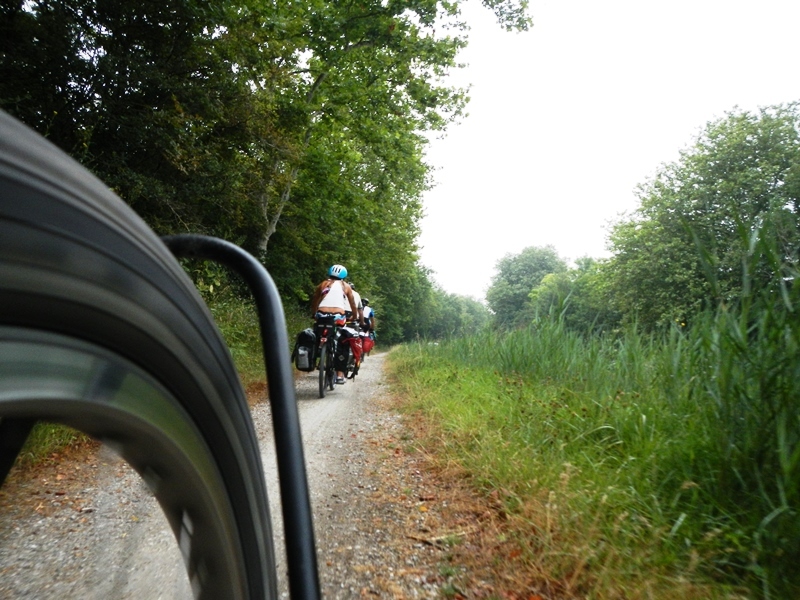 This is when we met ‘the matching pannier gang’ on a particularly narrow section. The matching pannier gang were 4 people, possibly a family, cycling along at a fairly slow pace all with matching panniers. As Neola arrived behind with the usual ring of the bell, they looked behind but instead of stopping, moving to the side or even acknowledging our presence they continued on their way despite further attempts to get by. They even stopped to look at some ducks at one point and still wouldn’t let us past. Eventually we barged our way past when the path widened at a bridge and pressed on. As we progressed, the terrain got worse. 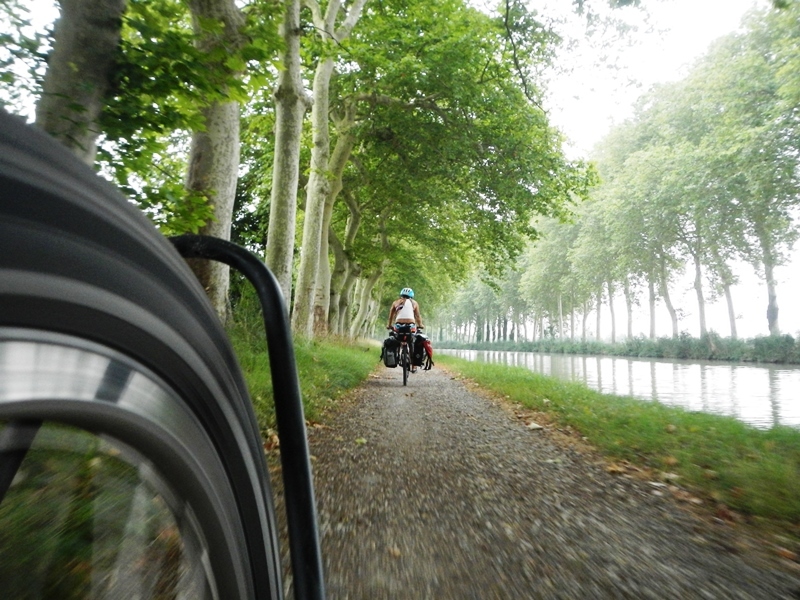 As we bounced over tree roots the size of kerb stones on single track paths that scraped our bags either side, we decided we would ditch the canal and get back on the road before we did any serious damage to our bikes or ourselves. 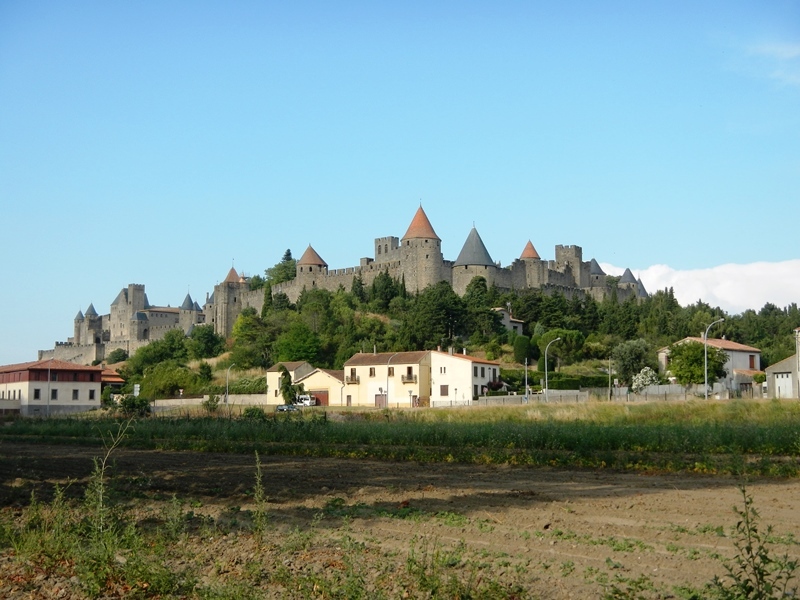 It turned out to be a masterstroke as with the cool breeze to our backs we flew through the next 15 miles towards the town of Carcassonne. Our route took us right through the centre of town and it was chaotic to say the least. After getting through the centre we crossed the bridge over the river when we saw the medieval city that presides over its modern day brother and even though it wasn’t really lunch time yet, it was so pretty we decided to stop anyway. 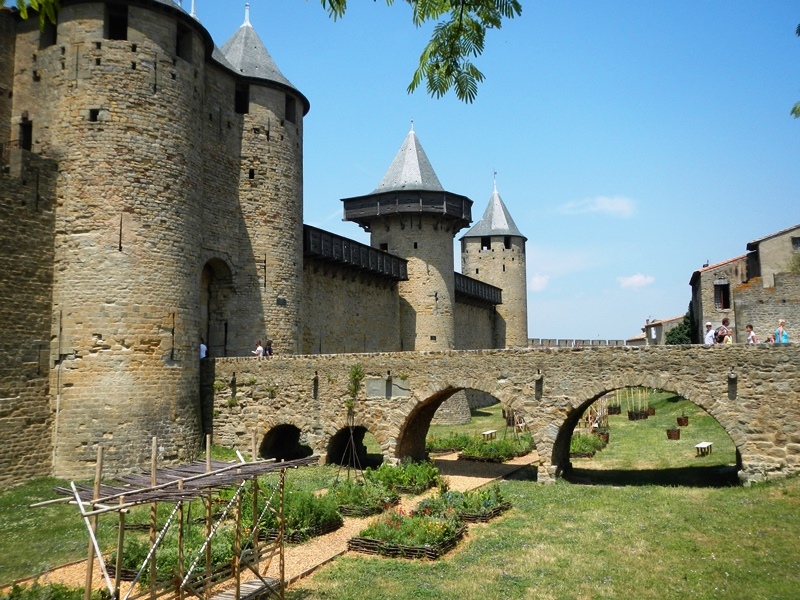 We’d read a leaflet about Carcassonne on our day off in Castlenaudry and it seemed like a lovely place, so it didn’t take much persuasion to cut our day short by some distance having only done 30 miles and stop there for the night, leaving us with most of the day to explore. 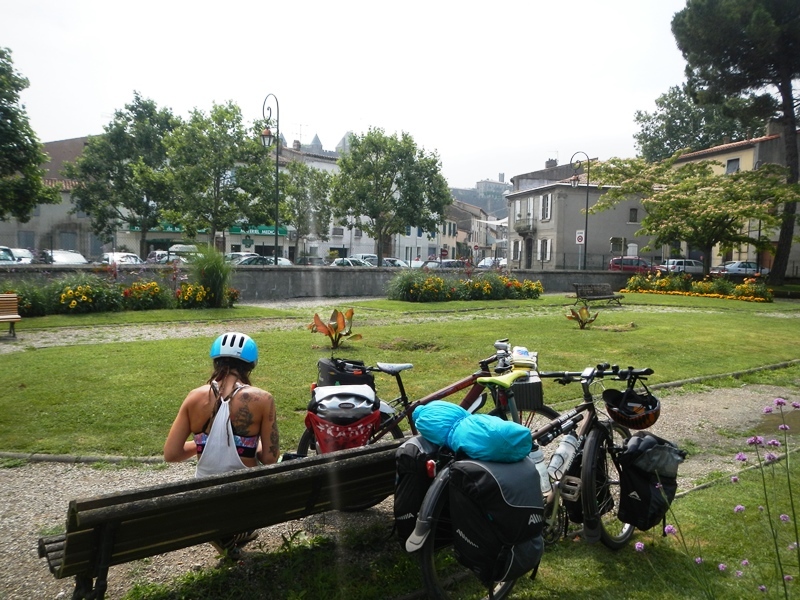 Prior to setting off, neither of us could understand the appeal of a pure cycling holiday, not stopping anywhere in between and being obsessed with daily mileage stats. 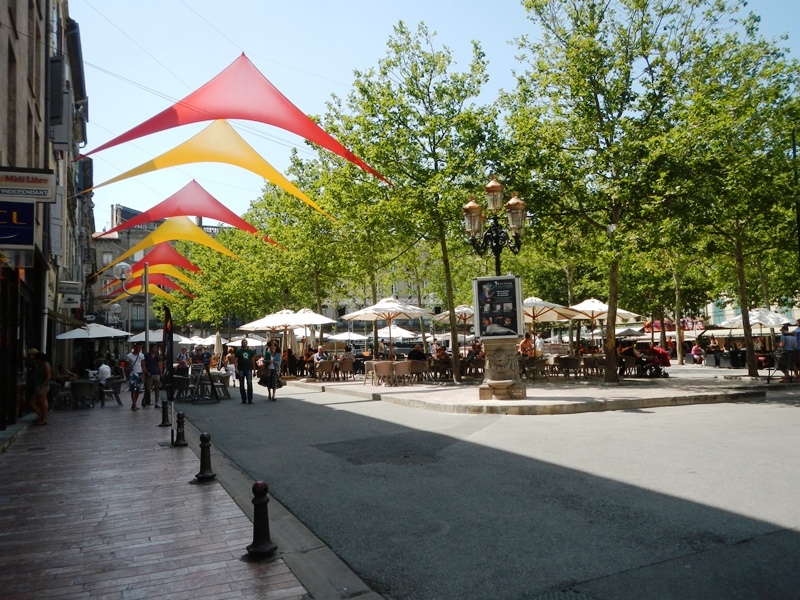 When we decided to stop in Carcassonne we were both a little bit disappointed in ourselves having cycled a mere 30 miles that day, which made us realise how much we’re actually enjoying the challenge of cycling and that, maybe, a cycling holiday wouldn’t be such a bad thing after all. 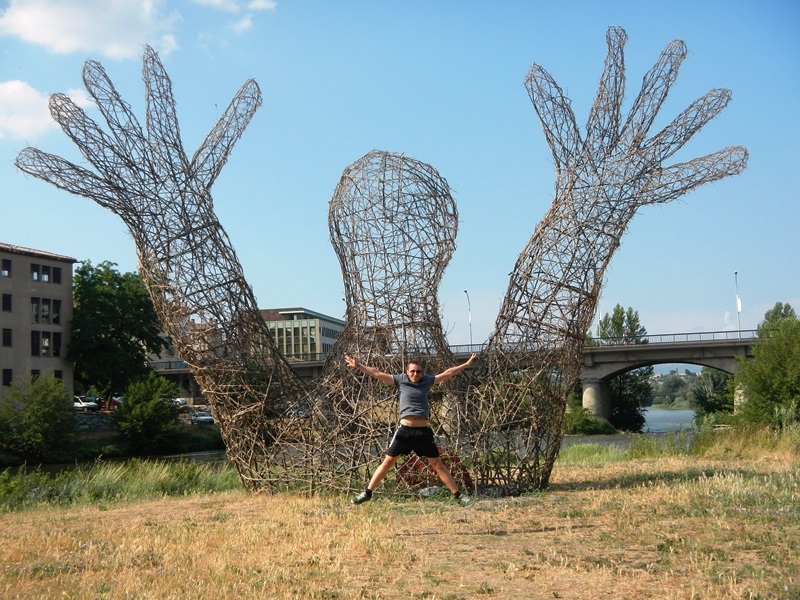 Don’t worry though, we’re not about to go on a Lycra spending spree just yet, this trip is all about the adventure, but it has got us thinking about other cycling challenges we might try our hands (legs) at in the future. 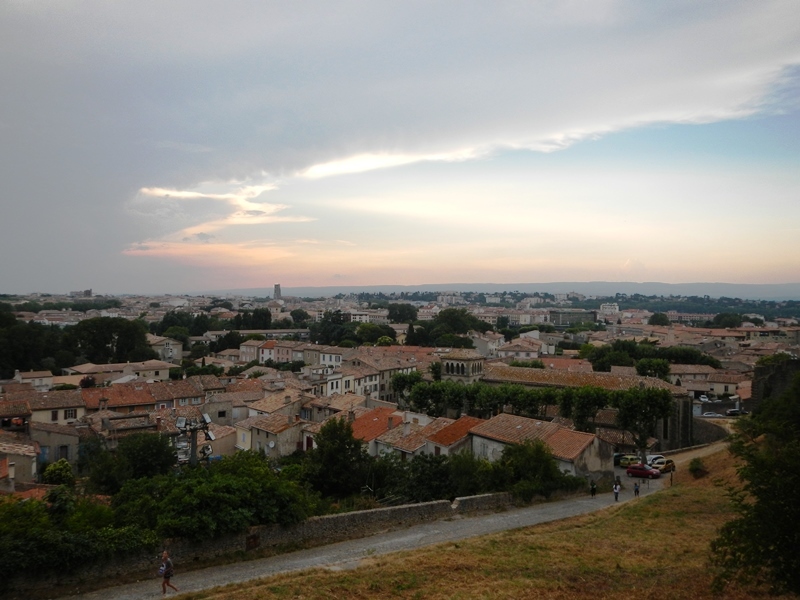 There was a campsite just outside the town and it wasn’t long before we had our tent set up and we were walking back to have a look at the old town. It was quite a climb up but when we got there the place was beautiful. 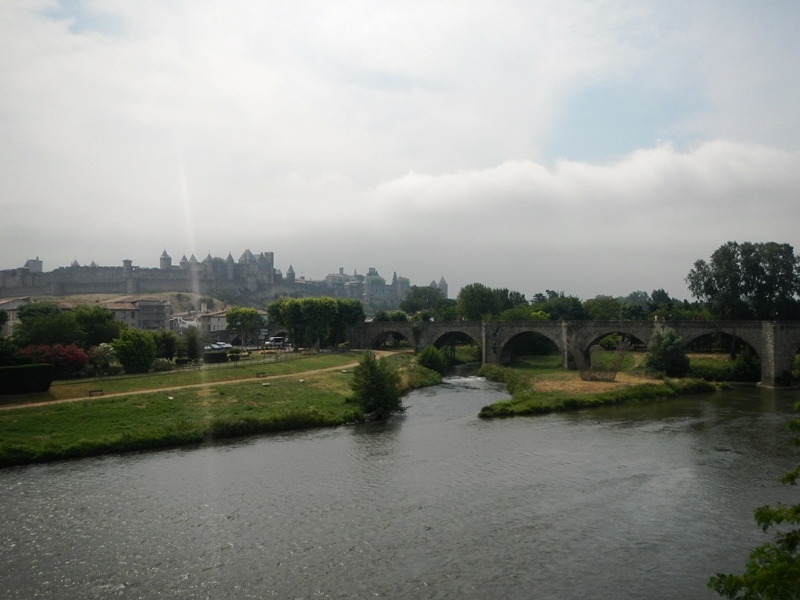 If Castelnaudary was France’s version of Halifax, this was definitely its answer to York, and it was just as busy too! 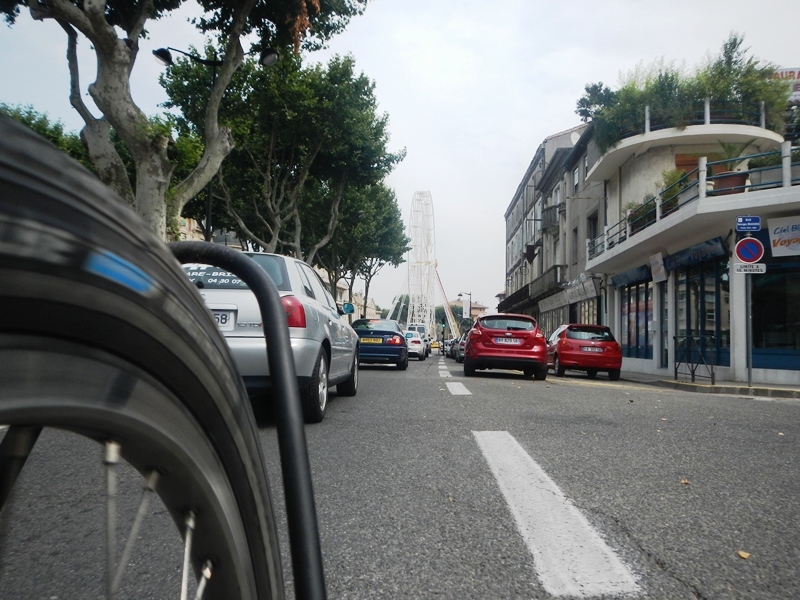 We strolled round a bit in the sun, looked at the lovely buildings and views, bought some post cards and even found some France stickers for our bikes. There were loads of touristy type shops (sweet shops, tat shops) and we passed most of them by but we were enticed into this nougat shop with free samples. Neither of us really liked nougat or even really thought about it before but this was awesome. There were big slabs of it everywhere and candied fruit too. 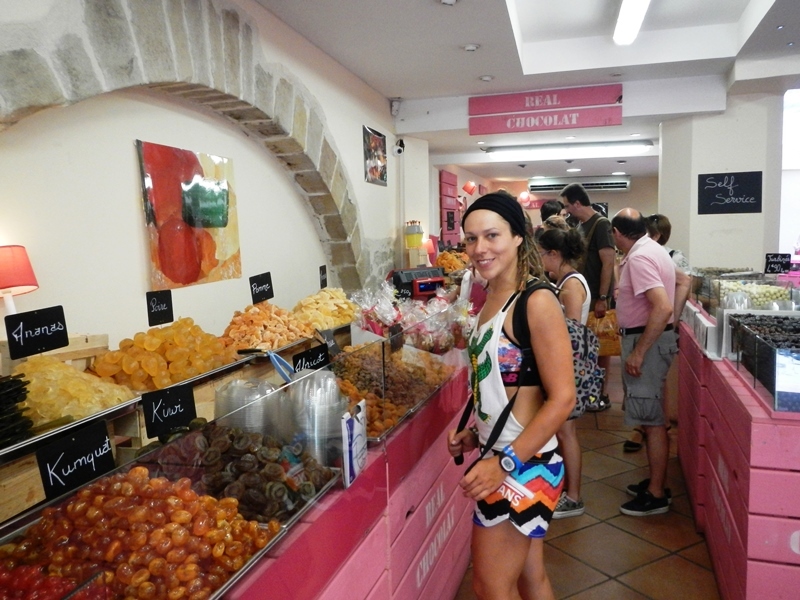 Importantly, there were loads of free samples and after trying everything in the shop we walked out having bought nothing. Sorry, but it was insanely expensive. Having not bought anything for tea and discovering that the restaurants in the old city were actually pretty reasonable we set about finding somewhere to go for tea later on. Whilst walking through a busy square, we saw a sign that said “Awarded 4th best pizza in the world, 2012” and that was all we needed. 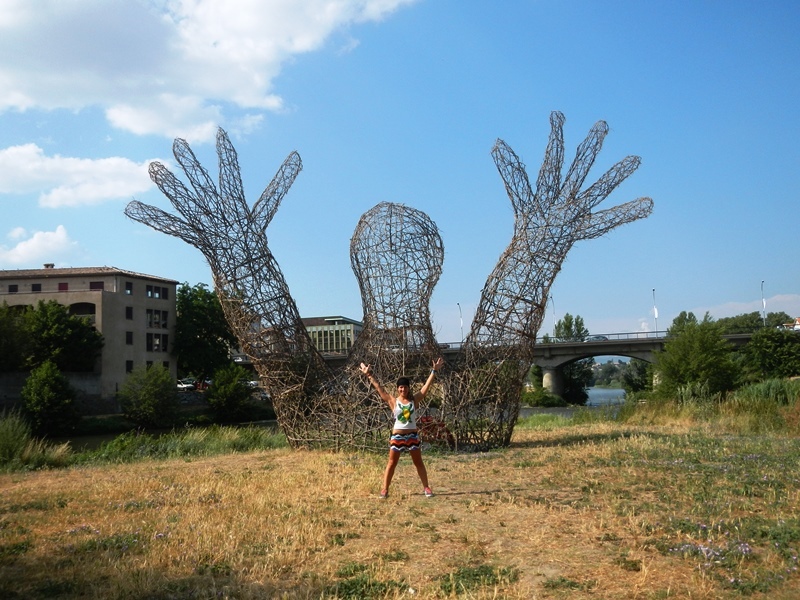 The newer city of Carcassonne was also really lovely, we had a look round there too whilst on the hunt for more WiFi and bumped into this giant happy wicker man along the way. 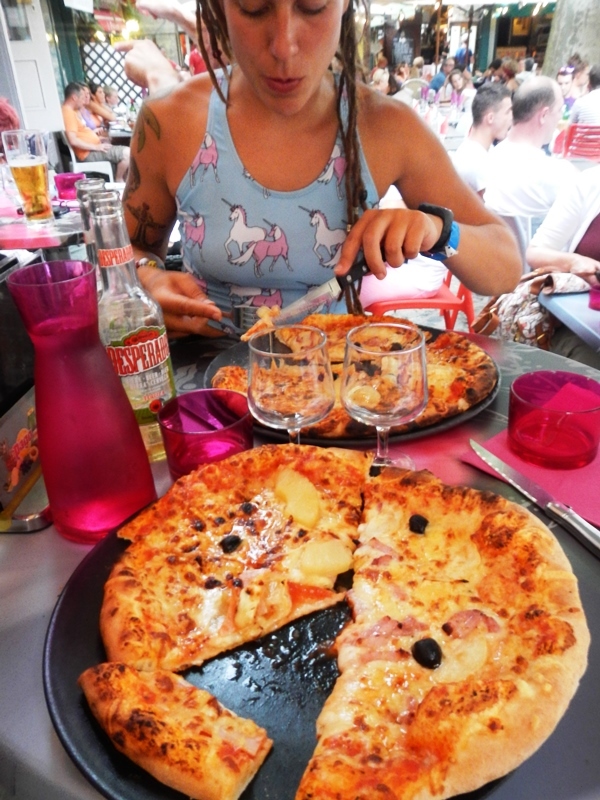 We returned to the 4th best pizza restaurant later that evening, somewhat less smelly, and it did not disappoint. One of the pizzas we tried had honey on it, which was a surprising taste sensation. They were delicious as you can tell from Neola’s face. Bellies full, we got an early night for another day of cycling. Next stop, Capestang. Bet you didn’t do what we used to do in Pizza Hut – & leave the lid loose on the pot of chillies for the next customer!